I reviewed David Boyle’s book on expert evidence earlier in the year. He has presumably decided to forego all forms of social interaction and has now written a general introduction to Personal Injury. The book places some emphasis on the “power of three”. I decided to set out my three favourite quotes. 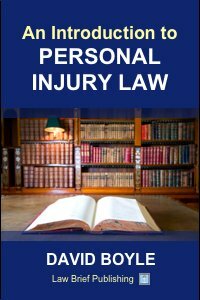 The book is an introduction to personal injury law. It covers the law of tort in general, before looking at specific areas – road traffic, public liability and employer’s liability. There is a section on limitation (wisely divided between the legal issues and the factual issues) before issues of damages are considered. My favourite chapter heading is “Things you don’t want to know”. This, understandably, is about cost – “the past and the future”. The introductory chapter contains important practical and strategic observations. This is not a detailed guide to procedure, however it is a useful and practical guide to personal injury law. It is aided by the author’s nuggets of wisdom and practical experience. Further guidance is needed if a litigator is going to navigate the minefield of contemporary procedure, however this is a useful tool in every litigator’s armoury.